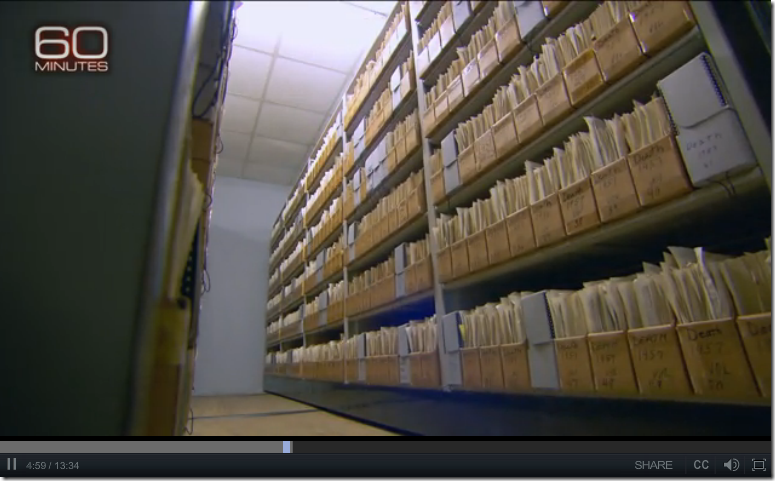 Not many of us get to see inside the record vault of a state’s vital records. 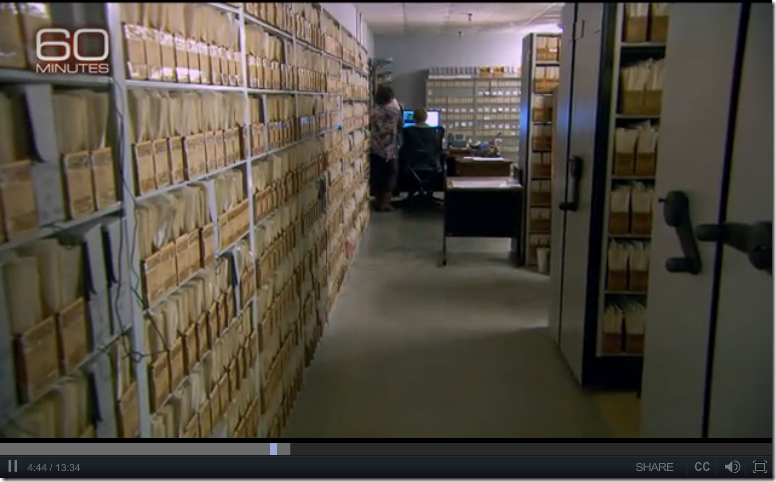 A recent segment on CBS’s 60 Minutes gave a very brief glimpse into the vitals records vault of the state of Alabama. Alabama death certificates from 1929. I think certificate number 12046 is in “volume” 25. Death certificate “volumes” are boxes of loose papers. 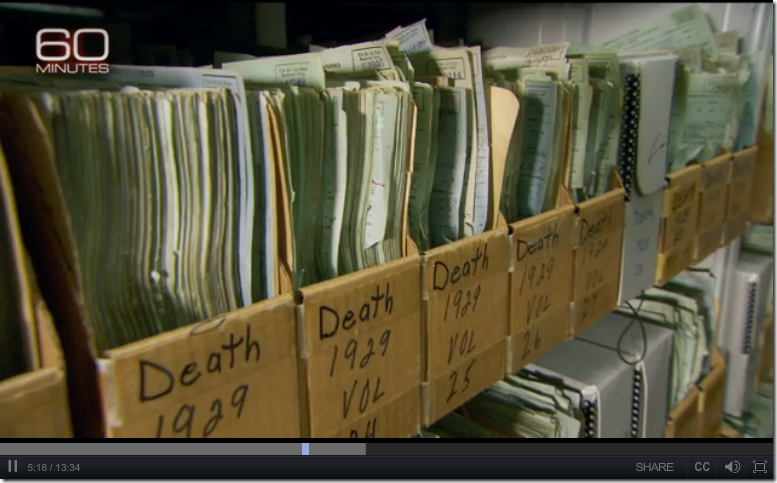 What I found interesting—and odd—is that the boxes of loose death certificates are labeled as volumes. Were these previously bound into volumes and then subsequently separated? Does anybody out there know? Is this a common practice in other states? Watch the entire segment, “Dead or Alive,” on the CBS News website. 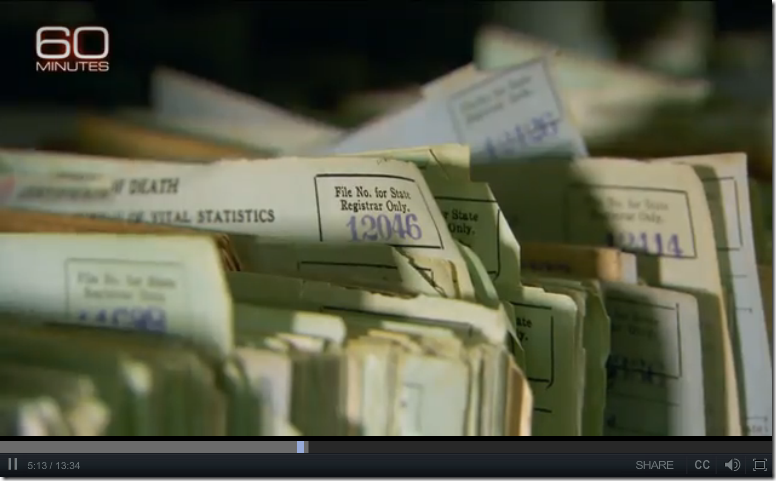 Scott Pelley, “Dead or Alive,” television segment, CBS News, 60 Minutes, 15 March 2015; archived video (http://www.cbsnews.com/videos/dead-or-alive/ : accessed 30 May 2015), time codes 4:44–5:19. Time code shown in each image's lower-left corner. A volume is any gathered collection of similar items, both bound and unbound, such as a series of periodicals identified with a label. In the case of these death registries the labeled boxes are the binding for the volumes. Perhaps Alabama used a system similar to that found in certain early estate records of Allegheny County, Pennsylvania. (More modern estate records of that county use an "estate number" or "probate packet" method that groups together all documents pertaining to a particular estate.) For example, older original wills of Allegheny Co. are labeled and stored according to the *volume and page number into which the information was recorded. * When a researcher cites an early Allegheny Co., Pa., will, they must specifiy whether they used the Will Book Vol. X:page Y (which is a bound clerk copy) or the loose papers Vol. X:Y (the original will). I believe other states might have used this method of filing certain docoments as well...at least for certain time frames. When volunteering as a FamilySearch indexer I recall coming across some Tennessee county marriages with images of loose papers labelled only with a vol. and page number. I do extensive work with a state vital records office. Perhaps the certificates were disbound at some point for either microfilming or more recently digitization (or "imaging" as ours likes to say). Sometimes you can do this sort of task still bound together, but it's much easier to handle separate pages. Of course here we then place the documents into folders and boxes for storage, instead of these open shelf files. Or there's the reality of records looking exactly as they are treated. In watching the news story, no the SSA is not the final authority on death. The purpose of the master index is keeping track of Social Security beneficiaries, it's just become a handy tool for others to use. Much like using birth certificates for citizenship (originally meant only for health statistics).